Attorney General William Barr declared Wednesday he thinks "spying did occur" against Donald Trump's presidential campaign, suggesting the origins of the Russia investigation may have been mishandled in remarks that aligned him with the president at a time when Barr's independence is under scrutiny. Barr, appearing before a Senate panel, did not say what "spying" may have taken place but seemed to be alluding to a surveillance warrant the FBI obtained on a former Trump associate. He later said he wasn't sure there had been improper surveillance but wanted to make sure proper procedures were followed. Still, his remarks give a boost to Trump and his supporters who insist his 2016 campaign was unfairly targeted by the FBI. Barr was testifying for a second day at congressional budget hearings that were dominated by questions about special counsel Robert Mueller's Trump-Russia investigation. His statements further inflamed Democrats already frustrated by Barr's handling of the Mueller report, including his release of a four-page summary letter last month that they say paints the special counsel's findings in an overly favorable way for the president. 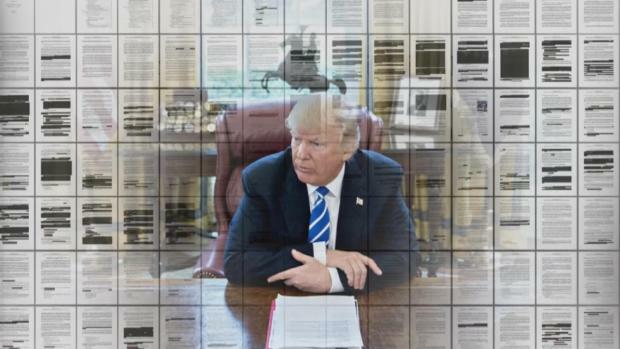 The attorney general said he expects to release a redacted version of Mueller's report on Russian interference in the campaign next week. At the Capitol hearing, senators appeared taken aback by his use of the word "spying." 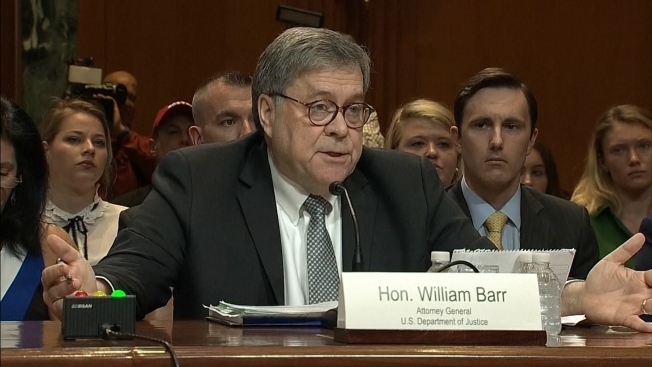 Asked by Democratic Sen. Brian Schatz if he wanted to rephrase his language, Barr said he simply wanted to make sure there was "no authorized surveillance." "Is that more appropriate in your mind?" he asked the senator. Barr is an experienced public figure who chooses his words carefully, and it's not clear if he realized what a political storm he'd create in using the word "spying." While the word could be used to describe lawful and necessary intelligence collection activities, for Trump and his supporters in this case it has an inherently negative meaning. 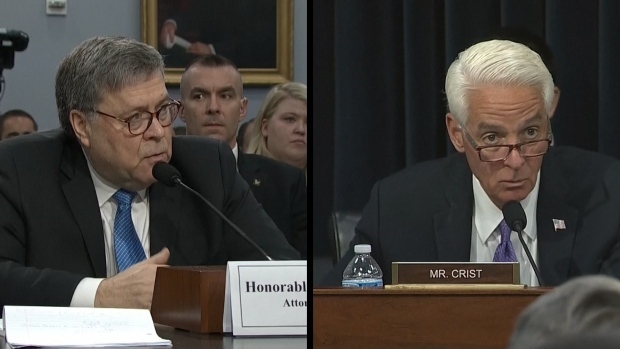 Attorney General William Barr took questions from Rep. Charlie Crist, D-Fla, about the Affordable Care Act during Tuesday’s hearing in front of the House appropriations subcommittee. Barr was asked about the Justice Department’s decision not to defend the law in court. Trump has repeatedly said the investigation of his campaign is an illegal "witch hunt." On Wednesday he said, "It was started illegally. Everything about it was crooked. Every single thing about it. There were dirty cops." 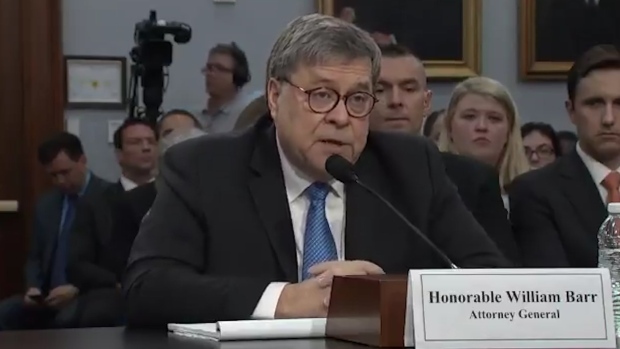 The spying discussion started when Barr was asked by Sen. Jeanne Shaheen, a Democrat, about his plans to review his department's actions in investigating Trump. A separate investigation is being conducted by the department's inspector general. Barr explained that he considered spying on a political campaign to be a "big deal," invoking the surveillance of civil rights protesters and then of anti-war protesters during the Vietnam War. Barr may have been referring to a secret surveillance warrant that the FBI obtained in the fall of 2016 to monitor the communications of former Trump campaign aide Carter Page, who has not been charged with any wrongdoing. That warrant application included a reference to research by an ex-British spy that was funded by Democrats to examine Trump's ties to Russia. Critics of the Russia investigation say the warrant was unjustified and have also seized on anti-Trump text messages sent and received by one of the lead agents involved in investigating whether the Trump campaign was colluding with Russia.